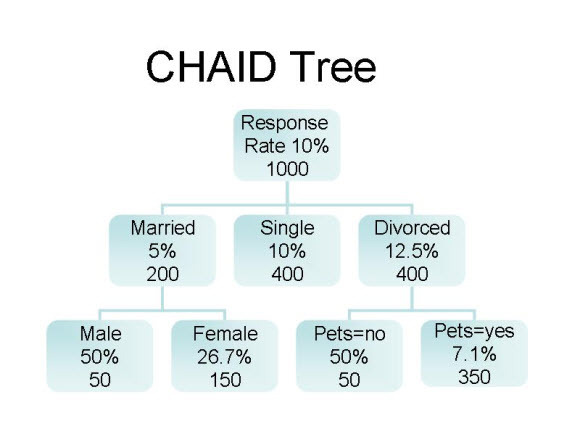 In addition to CHAID detecting interaction between independent variables – for explanatory studies that are concerned with the impact that many variables have on each other (e.g., in the Response Tree above, Martial Status & Gender, and Martial Status & Pet Ownership are two interaction variables as they differentially affect response rates across the bottom respondent groups) – it is often used as a prediction method. Using CHAID, the data analyst can uncover relationships between a dependent variable, e.g., response to a mail solicitation, and a host of predictor variables such as product, price, promotion, recency, frequency, and prior purchases. Accordingly, the result is a CHAID regression tree that allows the data analyst to predict which individuals are most likely to respond in the future to a similar mail solicitation. The above describes CHAIDs original intent, and frequent usage. (Hidden object lession: I noticed the tree has an arithmetic error in one of its nodes. I was going to correct it, but I leave it to the curious reader to find the error.